A new U.S. Department of Education report from the National Center for Innovation in Career & Technical Education (CTE) outlines the opportunities, challenges, instructional approaches, and noteworthy practices of U.S.-based simulated work-based learning (WBL) programs. The report cites how VE serves as a high-quality simulated WBL program and includes a site interview with Granville County Public Schools, which is currently one of 12 school districts in North Carolina implementing the VE program. A uniquely scalable approach for giving all students across America in-depth workplace and entrepreneurial experience during the school day, VE is implemented in hundreds of other districts around the country. The VE program currently serves 13,000 students a year across 500 middle and high schools throughout the U.S.
Catherine Imperatore provides a helpful summary of the report on ACTE’s CTE Policy Watch Blog, which details how WBL is integral to high-quality CTE, the models and benefits of simulated work-based learning, and keys to growing simulated WBL activities. 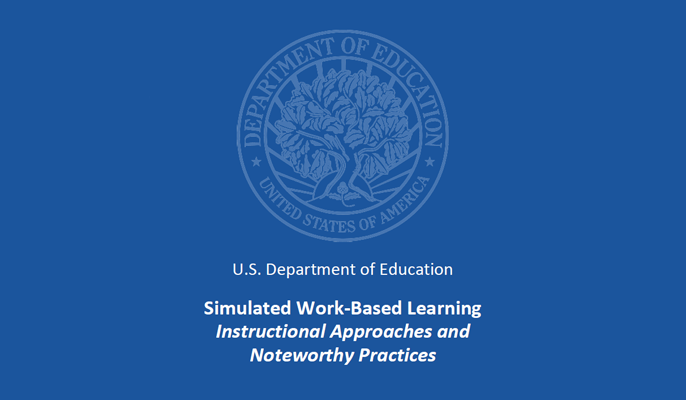 The full “Simulated Work-Based Learning Instructional Approaches and Noteworthy Practices” report is available on the U.S. Department of Education’s website and on the National Center for Innovation in Career and Technical Education’s website.